Cache Creek is slightly off the beaten path when it comes to satiating the voracious appetite you may acquire after a day rafting or kayaking. It is best to bring best to bring snacks for the car ride back to town or even a picnic to have next to the river if you think you won’t be able to wait at least an hour to quiet that rumbling belly. The nearest town is Brooks east of the whitewater area of the creek on Route 16. Further east is the larger city of Woodland. You could also drive to any variety of towns such as Clear Lake, Calistoga and even Napa for some grub but it is suggested that you pack a large lunch, some tasty bites for the road and head to these towns for a late dinner. Offers an array of options for your every dining need with eight restaurants and a Sweet shoppe. Choose from Fine Dining, Asian and Mexican inspired cafes, buffets, Sports Grill and Pub, 24 hour eateries and more. While there are a few dining options, the truly best meal you can have on the river is one you bring along for the ride. 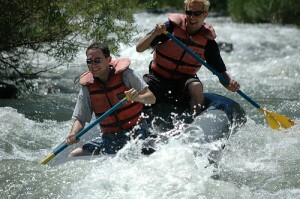 So pack your rafting group a hearty lunch and you can have your choice of riverside dining locales. Make sure to seal your Ziplocs, or purchase a drybag to keep the food in.